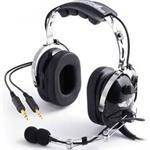 Rugged Air RA200 aviation headset with 24 db NRR. Clear Hear performance audio speakers. Volume control and 3.5mm music input jack for Ipods & MP3 players. Communicate with advanced technology, maximum comfort, sleek look, and a Lifetime Warranty — all for a reasonable price!